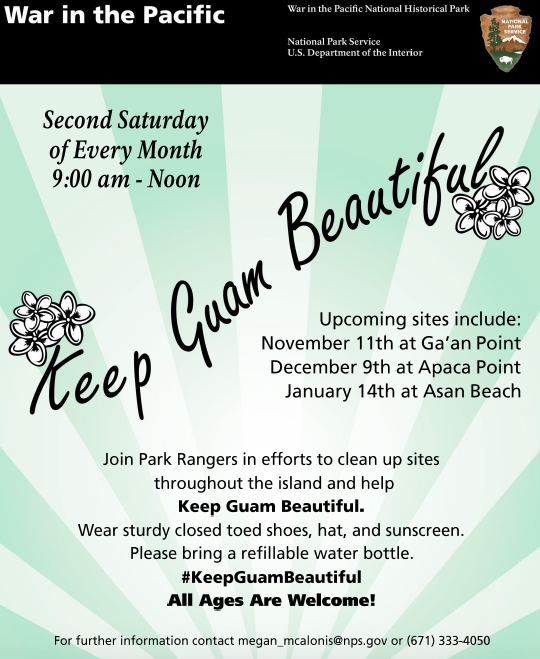 Join us in our Keep Guam Beautiful campaign to maintain and restore the National Park lands. Habitat Restoration Projects involve the community in assisting to maintain their public lands. These activities help to educate the community about the efforts that the National Park Service makes to maintain park public lands for the immediate enjoyment of the public and to preserve our public lands for future generations' enjoyment. Our hope is that the community will be inspired to become stewards of their public lands and local environment so they will cultivate an appreciation and as a result protect them. These events are held monthly on the second Saturday of the month. On December 9, the location is Apaca Point (Agat) and on January 14, the location is Asan Beach Park. Students under the age of 18 must get parents/guardian to fill out and sign a 301a form. Email Lisa M. Aguon at service.learning.doivista@gmail.com for an electronic copy. You can bring forms the day of the event or have parents/guardian fill out and sign a 301a form the day of the event. Wear sturdy closed-toed shoes, hat, and sunscreen. Please bring a refillable water bottle. Arrive at 9:00 a.m. to the location. Sign in with coordinator. Attend waste disposal safety training and overview of habitat and restoration projects on site. Assist park staff in cleaning predetermined sections of park units. Listen and abide by safety regulations. Pick up different types of litter in designated areas in park. Sort recyclable materials and other debris for proper disposal. Load and unload materials, tools and equipment needed for cleanup. Create a brochure or handout to encourage recycling, reducing, reusing, and re-thinking the consumption and disposal of resources, which can be distributed to the community when they sign up for a permit to utilize park sites. (Subjects: Science, Art, Environmental Science, Marine Biology, Project Management, Communications, & Computer). You can earn one hour of service learning for every hour you spend at the cleanup and one hour for the product and reflection. If you spend more time on your project, provide your teacher with your justification. In order to earn service learning hours, a reflection needs to be turned into a teacher who can input the hours into Power School. You need to address: What did you do? What did you learn? How was this an example of public service? If the product created in the activity includes this reflection, please use the product as your reflection. For example, your video or slide show could say: On December 9, I went to Apaca Point in Asan, which is part of the War in the Pacific National Park. I learned .... It was important to do this because .... To show our love of our island, we need to ... (Your service, the clean-up and the video/slide show, is then also incorporated into your reflection. Understand the importance of waste disposal and the effects of illegal dumping on our environment and natural habitats. Cultivate awareness on the amount of waste that we generate and develop proper waste disposal management that includes but, is not limited to Refusing, Recycling, Reducing, Reusing, and Repairing, Rethinking. Understand the importance of community stewardship in natural and cultural resource management through science. BI.1.4 Communicate the components and results of life science explorations using appropriate techniques. BI. 1.6 Demonstrate by actions in the school community caring and respect for the environment and living organisms. BI.2.30 Recognize and describe how human beings are part of Earth’s ecosystems and that human activities can, deliberately or inadvertently, alter the equilibrium in ecosystems.